Charles Osgood said goodbye to his loyal CBS "Sunday Morning" viewers on Sunday. Osgood, 83, who hosted "Sunday Morning" for 22 years, since taking over for Charles Kuralt in 1994, told viewers at the top of his final show: "[Today is] a very different edition of Sunday morning, different for you and certainly very different for me. As I told you a few weeks ago, today is my last day at Sunday morning. It turns out there truly is a time to every purpose under heaven as the book of Ecclesiastes tells us." "We are having a celebration of Charles Osgood, we begin at the beginning," Rita Braver, the senior correspondent for "Sunday Morning" said, and a celebration it was. The show started with his childhood, growing up in the Bronx, and then moving to Baltimore. His fellow "Sunday Morning" correspondents highlighted details of his life that many of his fans might not have known, like the fact he was the announcer for the United States Army Band and in 1955 he became President Dwight D. Eisenhower's personal disc jockey while Eisenhower was recovering from a heart attack. The show's look back at his remarkable, nearly 50-year-career at CBS, included recorded messages from a number of his peers -- if he can be said to have any peers -- at other networks, everyone from ABC's David Muir to NBC's Al Roker, Savannah Guthrie and Willie Geist. NBC's Lester Holt said: "Charles, I have watched you and listened to you for years as a fan and even competed against you on a lot of Sunday mornings -- still, as a fan, there is no finer broadcaster than you. So I say with great respect and admiration, I'll see you on the radio." "It all worked out pretty good," Osgood modestly said at one point cut:[of his success]. "If you do something every week and show up in their homes, they get to know you." Osgood, who every once in a while would play piano on the show, has another passion -- music. His fans learned during his final "Sunday Morning" that Osgood owns three Steinway pianos and even had a top 40 hit in 1967, "Gallant Men." It reached number 29, one spot above "Wild Thing." And, of course, there was discussion of Osgood's signature bow tie. An entire segment was dedicated to his love of colorful neck wear — he said he doesn't leave home without wearing one. The show included one fun fact about those bow ties: at one point, no one else at CBS was allowed to wear one. "When I heard you were leaving I thought, 'Maybe there's a place for me on CBS Sunday Morning, and then I realized there are certain requirements that you have to be aware of," Tom Brokaw said in his tribute to Osgood as he tried to tie a bow tie. "And I didn't know if I could get those requirements done. Ah hell, Charles, I can't do this. You're a master at everything you do, including tying a bow tie. I wish you all the very best." 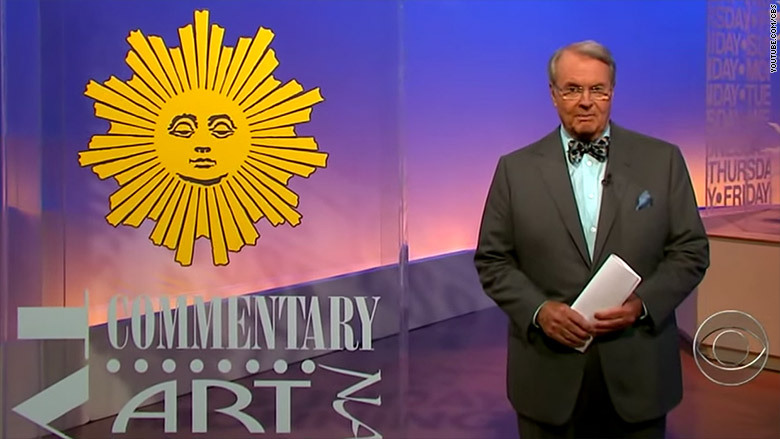 Jane Pauley, who will be Osgood's successor, came on at the end of the show to tell him that the bow tie he was wearing would be memorialized in the Smithsonian museum. "A lot of television is about ratings but I don't like to think of it as ratings," Osgood said. "I like to think of it as people watching the show and getting satisfaction out of it, learning something and not having something forced down their throats ... I do [love this show]. I cannot think of anything that has given me more pleasure, professionally than Sunday Morning. Because first of all it's great to be part of something that people love and I know that they do." Osgood closed out the show in a fitting manner by singing his own version of the 1940 hit, "So Long It's Been Good To Know You." Charles Osgood, it has been good to know you. We'll be seeing you on the radio.